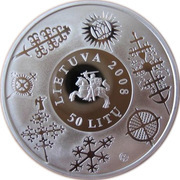 The obverse of the coin features examples of Lithuanian cross-crafting and its symbolism. In 2001, cross-crafting was included by UNESCO in the List of Masterpieces of the Oral and Intangible Heritage of Humanity. 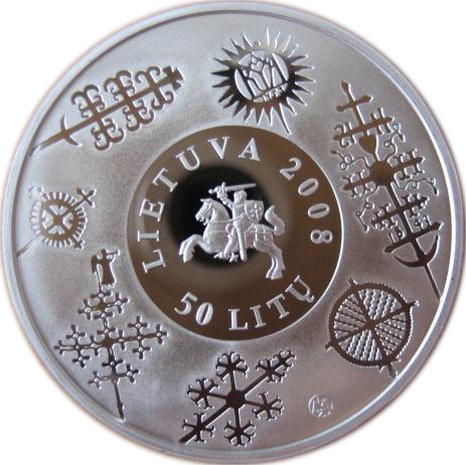 In the centre of the coin is the Vytis, surrounded by the inscription LIETUVA (Lithuania), year of issue (2008), and denomination (50 litas). 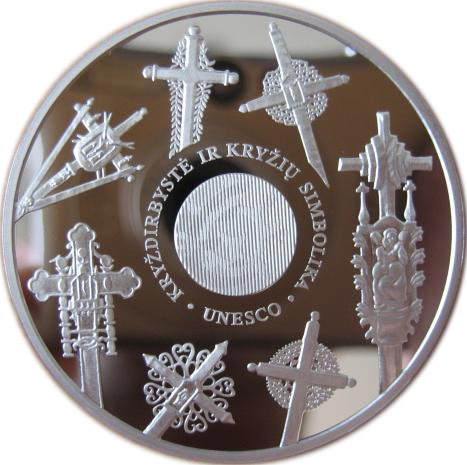 The reverse of the coin features examples of Lithuanian cross-crafting and its symbolism. In 2001, cross-crafting was included by UNESCO in the List of Masterpieces of the Oral and Intangible Heritage of Humanity. The central part of the coin bears a latent image: the logo of the coin programme, which is a stylised elliptical composition of the symbol of the euro (€) and a star from the flag of the European Union, as well as a picture of one of the symbols of cross-crafting. Surrounding this are the inscriptions KRYŽDIRBYSTĖ IR KRYŽIŲ SIMBOLIKA (Cross-crafting and its symbolism) and UNESCO.